Created by Dionna L. Hayden, Lucky Boots is a brand of books for young readers and their families that promote diversity, positivity, learning, and enjoying the life journey with excitement and adventure. Inspired by her late aunt "Lucky" and grandmother "Boots", Dionna has always dreamed to produce beautiful children's books since the age of 6. In 2014, the imprint Lucky Boots was born beginning with The Cookie-Flower Rock Kids, a series designed for elementary age readers that follows the lives of three young siblings as they learn how to grow in the world around them from their unique perspective. All Lucky Boots books are created and illustrated with stunning imagery, fun and relatable stories, and teachable lessons that kids love and parents appreciate. Each book is produced in outstanding quality and distributed worldwide to almost 40,000 retailers, libraries and schools. Creator of Lucky Boots who authors and illustrates The Cookie-Flower Rock Kids series. 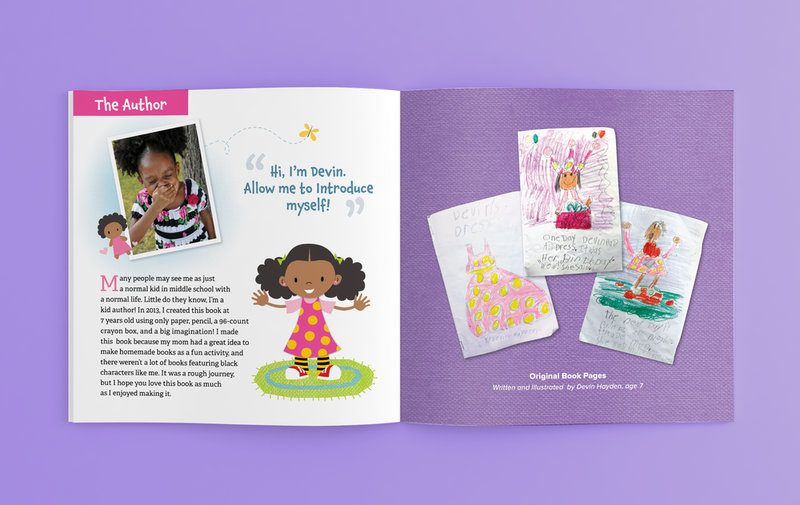 Meet Lucky Boots' youngest creative who's the author of her very own book, Devin's Dress.